A competitor put his life on the line to face the wrath of Badger up close. Bear growled on seven. Log creaked ominously as it swung over the cup on the second hole. 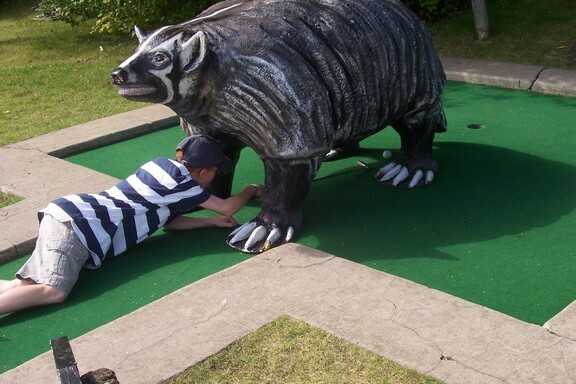 And Badger…well, Badger made whatever noise badgers make over on hole number three. Sixty men and women mingled quietly amongst these foreboding obstacles in the early morning hours of Aug. 5 at the Red Putter Mini Golf in Ephraim. Young men with eyes nearly as glazed as the donuts provided for the occasion sized up the course and the competition. Whispers were heard. Low murmurs came from bowed heads, chins on chests, as if not wanting to meet her eyes. 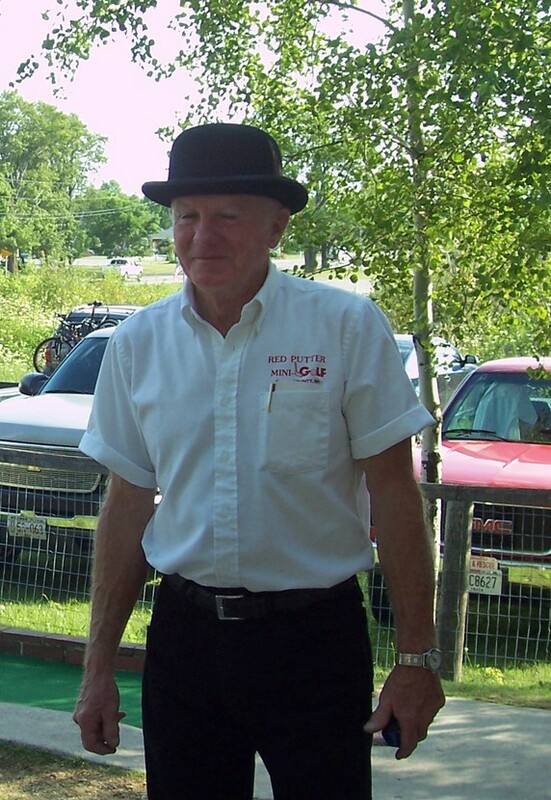 Red Putter owner Bob Yttri is the main reason people keep coming back to the Ephraim course. The 5th annual Red Putter Pro Tournament was about to begin, and “she” was on everyone’s mind. “She” is the pro. The ringer. The defending champ. Astra Miglane Stanwyck, the highest ranked female player in the country. A pro mini golfer from Mequon, Stanwyck was back to defend her 2005 title, won with a course record 111 over three rounds. Par is 126. “We’ve got to bring the title back to Sister Bay,” was the refrain running through the crowd. The contingent of area competitors didn’t seem to care who won, just so long as the trophy came back to Northern Door. Only those who pre-qualified with a score under par were allowed to compete in the tournament, where a $1,000 prize awaited the winner. Jeremy Staver talked about the challenge ahead shortly before the bell rung to kick off the event. Zach Higginbotham, a former runner-up, focused on other aspects. Bob is Bob Yttri, owner of the Red Putter, and here-after referred to only as Bob. Formality is not required for a man known to say “I don’t have customers, I have friends.” And that he does, garnered over 14 years in the business. 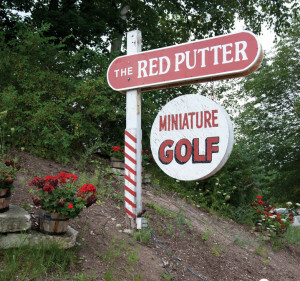 The Red Putter was opened by Clyde and Lucille Logerquist in 1974. Bob’s daughter, Tracy Yttri-Opper, said the family would play the course all the time when she was growing up. He started the tournament with a bunch of his friends five years ago. The first year there were about 32 golfers and the tournament was unsanctioned. Bob didn’t like all the pro tour rules, so he used them as a base and changed them to fit his course. 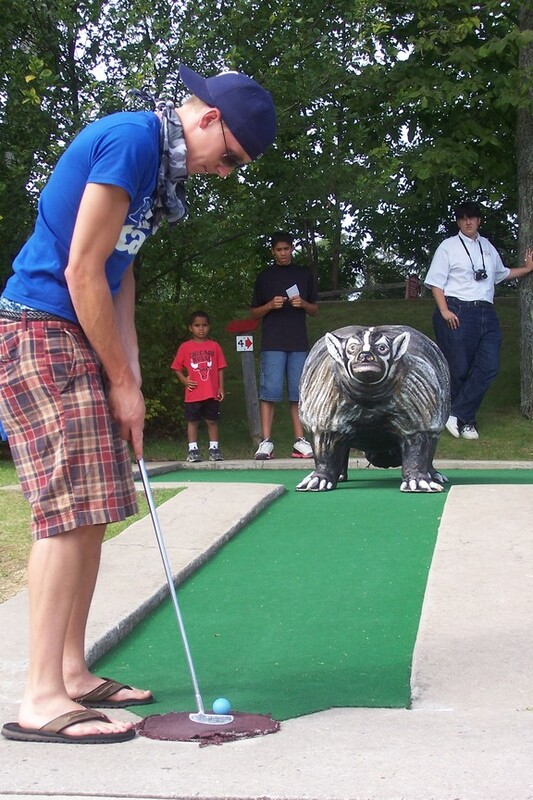 Now, he says, the tour has adapted to some of his rules, and his event is sanctioned by the United States Professional Miniature Golf Association. Adam Biwer chose a new tactic this year, turning the tables on Badger and trying to intimidate the brute with his attire. Stanwyck was here to play her third straight Red Putter Championship, and she said Bob is the main reason she returns each year. “It’s his character, his friendliness that just makes you want to come back,” she said. Stanwyck said she plays in six to nine mini golf tournaments each year. Later this year she’ll travel to Mazatlan to play in the European Championship and Yokohama for the Asian Championship. The veteran said the 60 participants at the Red Putter annual are more than any other in the country. Stanwyck would start on hole number two, where the Log-a-Swingin’ has felled many an amateur. “Moots,” as it’s called by those who liken its putt-blocking ability to the shot-blocking of NBA star Dikembe Mutumbo, didn’t faze her. She aced the hole to start the day and the battle was on. One against 59. Everyone chasing Astra. Several local favorites appeared to be suffering from a common mini golf malady – the hangover. Matt McComas dropped out after a miserable first round. Adam Biwer and Higginbotham faded early, as did former champions Paul Nelson and Mark Schleicher. After two rounds only one local, Rick Chomeau, remained within striking distance of Stanwyck, just one stroke off the torrid pace which brought her into the clubhouse with a 33 and 37. Eddie Strege, considered a contender, hinted that the weather was affecting his play. “With these British Open-like conditions, you have o keep the ball down,” he said, referring to the breeze which brought gusts of three to four miles per hour. In round three Chomeau still had a chance, as did Mark Schroeder, but Stanwyck would prove unflappable. As the mighty Bear frustrated many who hoped to finish only with a respectable score, she pulled away. She rolled to the finish in Tiger-at-Augusta fashion, obliterating her previous record by seven strokes with a three-round tally of 104. In any other year, Schroeder would have owned the record, and the day, as they posted scores of 109 and 110 respectively. Today, it was not enough. Stanwyck, who began playing in Latvia in 1993 and was the first woman to represent her country in the European Championships, said she made five trips to the course to put in long days of practice in recent weeks. The work seemed to make her feel right at home on the Ephraim greens. When all was said and done, Schleicher could only take solace in past glory. “In three years, I’m the only one who’s beat her,” he said proudly. He bested Stanwyck in a playoff in 2004, one that has become the stuff of putt-putt legend. Arnie vs. Jack. Tier vs. Phil. Astra vs. Mark. The lineage of rivalry bleeds down from Augusta National to Pebble Beach and finally, to the Red Putter. But not this year. The title went home with her, back to Mequon.